We were recently asked for our views on the remodelling of a major roundabout in Darlington. The roundabout in question is where McMullen Road meets Yarm Road. We can’t share the drawing with you yet, as it is embargoed, but here are our conclusions and recommendations. However, it is fair to say that the redesign was all about increasing the number of motor vehicles that can fit onto this section of road at peak times. 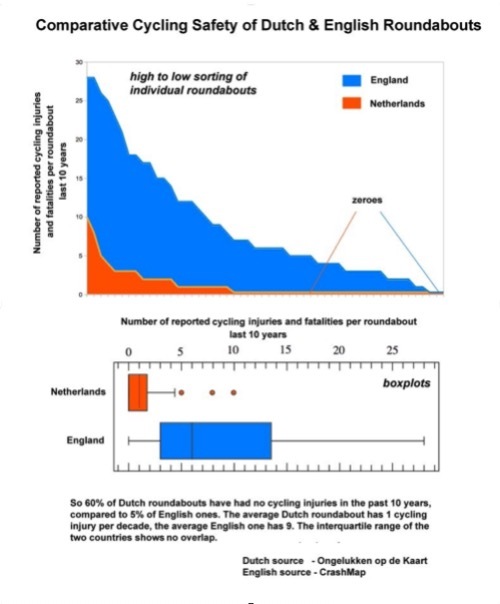 We know that the British way of designing roundabout make them more dangerous for people who cycle than the Dutch model. This graph shows just how much more risky – nine times as dangerous! Do British highways engineers know that they are building in risk for years to come? Taking a broad view of the plans we asked two questions. 1) Does this plan increase provision for people to cycle safely? The answer was, only marginally. The shared use paths on Salters Lane are an addition, however, we see shared use paths as a poor substitute for proper provision for people who cycle. 2) Does this plan decrease provision for people to cycle safely? Alarmingly the answer here is a resounding Yes. The wider carriageways will make crossing arms of the roundabout more dangerous for vulnerable road users. Crossing distance and time will increase. Vehicles in the left hand lane will be masked by vehicles in the right hand lane. Wider carriageways will induce higher driver speed, increasing risk to all road users, vulnerable road users being at greatest risk. If this council’s commitment to increasing active travel means anything, this plan needs revisions. Looking at the plans in more detail we saw the following problems. Segregation, cycleways and shared use. There is a reduction in the amount of segregated cycleway. Heading west on Yarm Road towards Salters Lane, the segregation turns the corner, this proposal cuts off the segregation before the corner. The plan is confusing, as the key makes no reference to cycleways, only footways. However, some footways, have cycle symbols on them. What width are the cycleways? Do they comply with table 2.2.11 of Interim Advice Note 195/16? This recommends one-way cycleways between 2.5m and 4.0m and two-way cycleways between 3.0m and 4.0m. Making these shared use, would require increased width. Off road cycling, crossing arms of the roundabout. 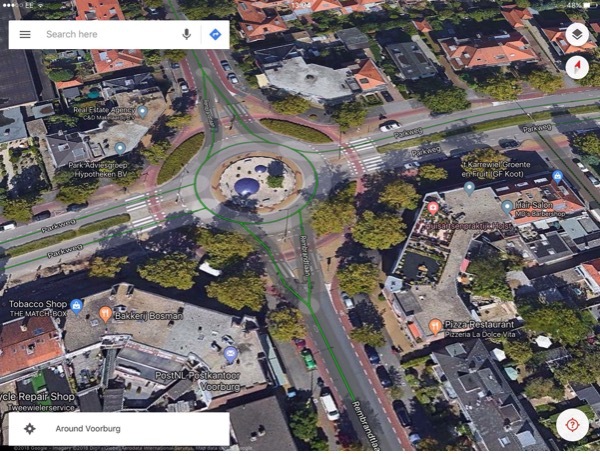 When crossing the arms of the roundabout, we doubt that the refuges would safely accommodate a design cycle of 2.8m (l) x 1.2m (w), as per figure 2.2.4.1 of IAN 195/16. Definitely there would be conflict if two people cycled together or met someone cycling in the opposite direction. Cycle crossings at roundabouts should follow the advice contained in table 2.4.2 of IAN 195/16, Parallel (tiger) pedestrian/cyclist crossing, desirably on raised table. With no decent off road provision for people who cycle, how are those who chose to cycle on the road treated? Cycling North on Salters Lane and wanting to turn right. There is no meaningful provision, people cycling would need to ‘claim the lane’ and hold their position in the middle of the road. They are at risk from close passes and undertaking. Heading East on Yarm Rd (from town) and not turning left, there is no meaningful provision. People cycling would need to ‘claim the lane’ and hold their position in the middle of the road. They are at risk from close passes and undertaking. For people cycling on the roundabout and heading East on Yarm Rd, the access to join the cycleway is very dangerous. 1. Reduce the diameter of the island at the centre of the roundabout. 2. Narrow the vehicle lanes as much as possible. 3. Points 1&2 would require wider over run strip on roundabout apron. Make the apron angled and textured to discourage high speed over run by small vehicles. 4. Table top the crossing points on each arm of the roundabout. Provide parallel pedestrian and cycle crossings (without priority). 5. Increase the size of the refuges, to allow separate pedestrian and cycle crossing points. 6. Provide segregation of cycle / pedestrians on both footways on Salters Lane. 7. Provide off carriageway segregation on turn from McMullen Rd into Retain Park. 8. 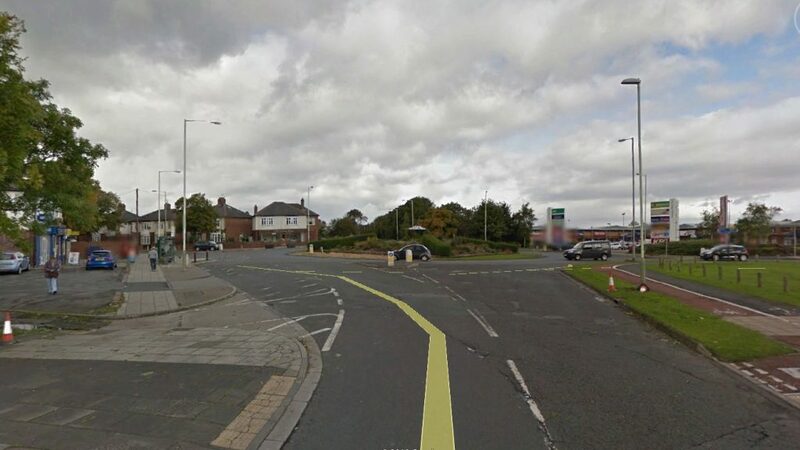 Provide off carriageway segregation on turn from Retail Park into Yarm Rd heading East. 9. Provide off carriageway segregation on turn from Salters Ln into Yarm Rd heading West. (Points 6 to 9 accommodated by reduced lane width and island diameter. 10. Install a segregated cycle lane on Yarm Rd heading East, from town, starting before the left filter lane appears (approximately 70m before the give way line line), linking into segregated turn lane into McMullen Road. 12. Take steps to control off peak traffic speeds by installing average speed cameras on each of the three main roads. 13. Consider changing the name of Salters Lane as it causes confusion with Salters Lanes North and South. We welcome Darlington Borough Council asking for our views on the planned changes to this roundabout and we hope that improvements are made to reduce the risks to people who cycle.